Dimensions: total height 81cm, seat height 45cm, width 44cm, depth 50cm, weight 3,25kg. Available colors: White, Silver grey, Dark grey, Black, Tropical green, Light blue, Orange. 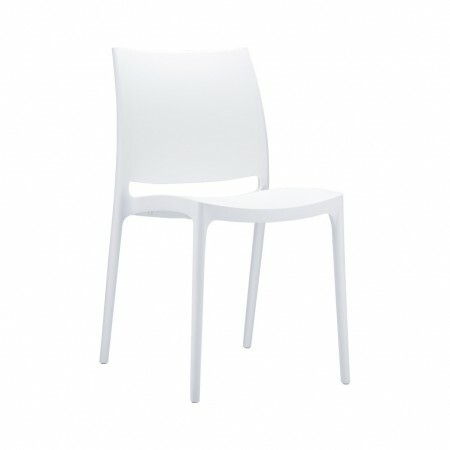 MAYA is a elegant and comfortable stackable chair. With great charm, MAYA can be used both indoors and outdoors. A chair able to donate great prestige in any environment. Extremely solid and robust, is in fact been designed for "contract" market, where the use intense and continuing of the furnishings is frequent and where the robustness in the long run must be a guarantee. It must in fact be noted that MAYA is realized n polypropylene resin reinforced with fiber glass by means of the latest generation of air molding technology. Furthermore, this article is also equipped with treatment against atmospheric agents, as well as protection from UV rays in order to avoid possible discoloration. Important: in the colors darks, shadows and other minor imperfections are more evident than on lighter colors and are therefore to be considered in the standard. For indoor or outdoor use. Ideal product in contract projects. We recommend pairing with the many Siesta Exclusive tables, visible below in related products.